We are just over two weeks into the New Year — how are you doing on your New Year’s Resolutions? Historically, 78% of people keep their resolutions for the first week, but there’s a significant drop off after that. Taking care of yourself physically and mentally is extremely important, especially to us at the University of Southern California where we have a strong understanding of mental health as it is one of our biggest concentrations at the School of Social Work. 2011 was a whirlwind year. And with the explosion of social media outlets like Twitter, it’s been exponentially easier for us to keep up with what’s been going on in the world. With everything from the Occupy Movement, to Osama bin Laden’s capture, to the passing of Apple’s leader, Steve Jobs, we’ve been able to stay informed and communicate with each other, down to the second. So as we begin a new year, what will we see when we look back on 2011? Here is 2011 in a nutshell in the words of Twitter, as well as what topics to expect in 2012. Baseball Bat – How Much Time Does It Take for a 95 M.P.H. Fastball to Reach Home Plate? 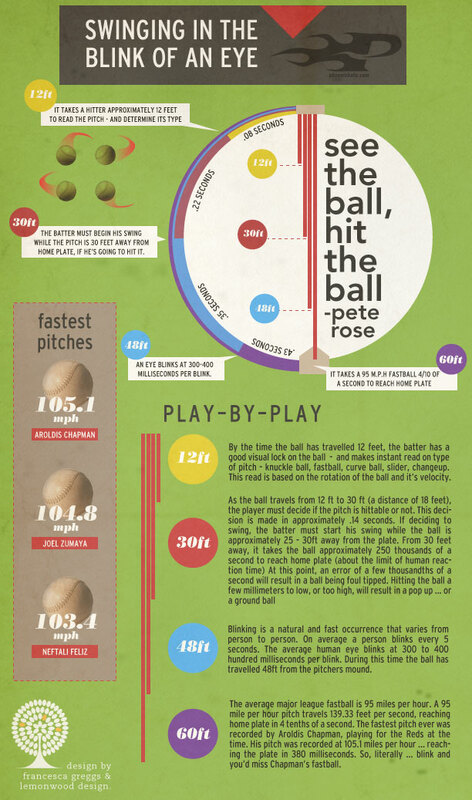 The infographic displays some intriguing facts of how fast a batter needs to swing a baseball bat in order to hit a 95+ M.P.H. fastball and at what point they are able to determine the type of pitch (e.g. fastball, slider, changeup, curve ball, etc).